Yesterday, the City Council passed a bill that says New York City must cut greenhouse gas emissions 80% by 2050. The bill, which was approved 47-0, was sponsored by Queens Councilman Costa Constantinides and is expected to be signed into law by Mayor de Blasio. 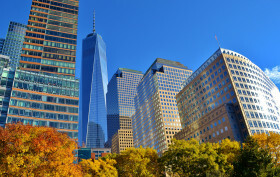 To reduce emissions, measures similar to those used for PlaNYC will be put into play, including planting trees and retrofitting buildings to be more energy efficient. But we also suspect that the bill will spur a wave of new green developments.